Karla Huston is the author of five chapbooks of poetry: A Halo of Watchful Eyes (Wolf Angel Press 1997), Pencil Test (Cassandra Press 2002), Flight Patterns (Main Street Rag Press 2003), and Virgins on the Rocks (Parallel Press 2004), and Catch and Release (Marsh River Editions). 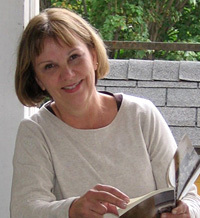 Winner of many writing awards, including the Main Street Rag Chapbook contest, she has published poetry, reviews and interviews in several journals including Cimarron Review, 5 A.M., Free Verse, Margie, North American Review, One Trick Pony, Pearl, Rattle and online www.smartishpace.com. "There is no situation too absurd or trivial that Huston is unable to invest with a humour strangely filled with gravitas, not even her forgetting what she wanted to write as she attempted to begin a poem. Like Margaret Atwood, Ms Huston is a poetess of confidence  the power in her writing comes not so much from her subjects, which are wondrously diverse, than from the fact that she writes." Zhuang Yisa: Quarterly Literary Review Singapore: July 4, 2006.